Search publications related to international media, information and development, produced by Internews, our partners, and related organizations. Over the past decade, radicalization to violent extremism has become a matter of pressing public and political concern in Central Asia. Eva Constantaras, data journalism trainer for Internews, has written a chapter titled, "Data Journalism By, About and For Marginalised Communities" for The Data Journalism Handbook based on her work training journalists for Internews. Internews has developed a humanitarian learning collection based on its experience supporting local media for displaced communities and refugees in South Sudan. 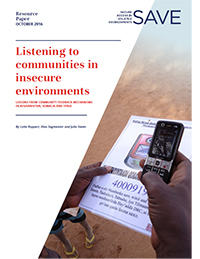 Listening To Communities in Insecure Environments aims to contribute solutions for providing effective and accountable humanitarian action amid high levels of insecurity. 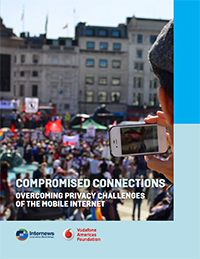 Compromised Connections: Overcoming Privacy Challenges of the Mobile Internet is a brief introduction to emerging security issues facing mobile phones in development. 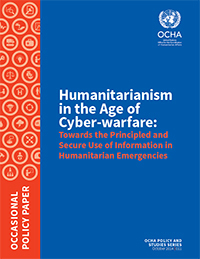 Humanitarianism in the Age of Cyber-warfare: Towards the Principled and Secure Use of Information in Humanitarian Emergencies recommends that the humanitarian sector develop robust ethical guidelines for the use of information. 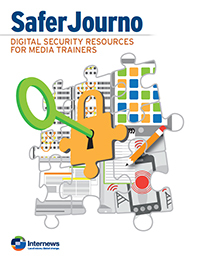 SaferJourno: Digital Security Resources for Media Trainers is a free and open-source curriculum guide for media trainers who teach students, professionals and peers digital safety and online security. 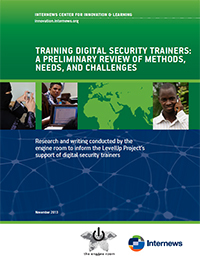 Training Digital Security Trainers: A Preliminary Review of Methods, Needs, and Challenges draws on interviews with trainers and coordinators whose end-goal is the support of human rights defenders, civil society, activists, and local media worldwide. 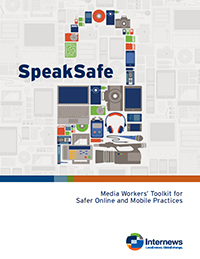 SpeakSafe: Media Workers’ Toolkit for Safer Online and Mobile Practices (English version) introduces reporters, journalists, bloggers and media workers to simple yet effective practices to maintain control of important information and communications. 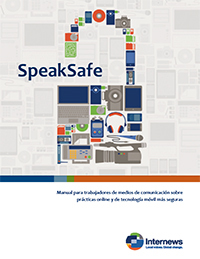 SpeakSafe: Media Workers’ Toolkit for Safer Online and Mobile Practices (Spanish version) introduces reporters, journalists, bloggers and media workers to simple yet effective practices to maintain control of important information and communications. 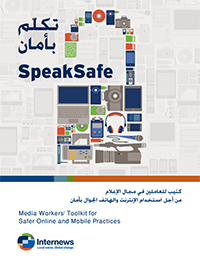 SpeakSafe: Media Workers’ Toolkit for Safer Online and Mobile Practices (Arabic version) introduces reporters, journalists, bloggers and media workers to simple yet effective practices to maintain control of important information and communications.